Measles starts with fever, runny nose, cough, red eyes, and sore throat. It's followed by a rash that spreads over the body. Measles virus is highly contagious and spreads through the air through coughing and sneezing. Measles can be prevented with the measles, mumps, and rubella (MMR) vaccine. The measles outbreak in neighboring areas of Washington and Oregon is ongoing. Public Health urges anyone who has been exposed and believes they have symptoms of measles to call their health care provider prior to visiting the medical office to make a plan that avoids exposing others in the waiting room. People who believe they have symptoms of measles should not go directly to medical offices, urgent care centers or emergency departments (unless experiencing a medical emergency) without calling in advance. CDHD encourages people to check their immunization records and those of their children to ensure they are up-to-date on their MMR vaccine. If you are unsure about your vaccine status, contact your health care provider or the health department in the state(s) you may have received vaccines in. Note: You may need to make a formal immunization records request in writing. Measles is a highly contagious virus that lives in the nose and throat mucus of an infected person. The symptoms of measles generally appear about seven to 14 days after a person is infected. Measles typically begins with high fever, cough, runny nose (coryza), and red, watery eyes (conjunctivitis). Two or three days after symptoms begin, tiny white spots (Koplik spots) may appear inside the mouth. Three to five days after symptoms begin, a rash breaks out. It usually begins as flat red spots that appear on the face at the hairline and spread downward to the neck, trunk, arms, legs, and feet. Small raised bumps may also appear on top of the flat red spots. The spots may become joined together as they spread from the head to the rest of the body. When the rash appears, a person’s fever may spike to more than 104° Fahrenheit. After a few days, the fever subsides and the rash fades. 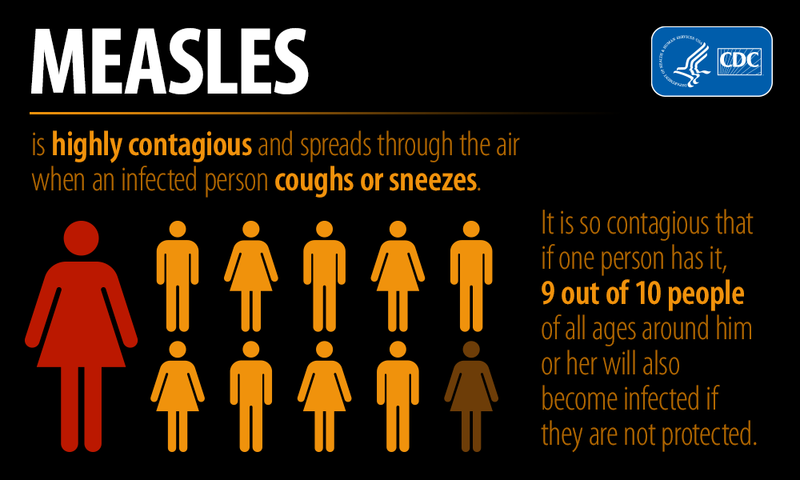 Measles can spread to others through coughing and sneezing. Also, measles virus can live for up to two hours in an airspace where the infected person coughed or sneezed. If other people breathe the contaminated air or touch the infected surface, then touch their eyes, noses, or mouths, they can become infected. Measles can be prevented with the MMR vaccine. The vaccine protects against three diseases: measles, mumps, and rubella. CDC recommends children get two doses of MMR vaccine, starting with the first dose at 12 through 15 months of age, and the second dose at 4 through 6 years of age. Teens and adults should also be up-to-date on their MMR vaccination. The MMR vaccine is very safe and effective. Two doses of MMR vaccine are about 97% effective at preventing measles; one dose is about 93% effective. Children may also get MMRV vaccine, which protects against measles, mumps, rubella, and varicella (chickenpox). This vaccine is only licensed for use in children who are 12 months through 12 years of age. Before the measles vaccination program started in 1963, an estimated 3 to 4 million people got measles each year in the United States. Of these, approximately 500,000 cases were reported each year to CDC; of these, 400 to 500 died, 48,000 were hospitalized, and 1,000 developed encephalitis (brain swelling) from measles. Since then, widespread use of measles vaccine has led to a greater than 99% reduction in measles cases compared with the pre-vaccine era. However, measles is still common in other countries.